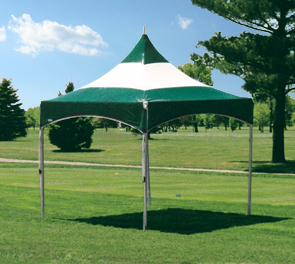 With it's sleek and stylish look, this event tent is perfect for almost any event. From concession stands to shade for corporate events, you'll find the Millennium 2000 a perfect fit. Durable and easy to install, this tent requires no tools for assembly. High peaked top gives plenty of wide open space beneath the canopy, as center pole is suspended on cross cables in tension structure above. Corner ratchet system allows for a shorter set up time. No bolts, pins or small parts to lose. Aluminum construction mean no rust. Unit comes with four, 30" white nail head steel stakes and storage bag for vinyl top. Constructed with UV protected Vinyl and Aluminum 1-1/2" x 2" O.D. Tubing this tent will with stand the elements and provide the outdoor shade you require. Sizes: 10', 15', and 20' square. Horizontal stripe optional. On the right an inside detail of the Millennium 2000 Support Structure. The center pole is suspended and doesn't get in the way.